MCP Math Level E Homeschool Kit, 2005C Ed. MCP Mathematics Level E (5th Grade) Student Workbook, 2005C Ed. 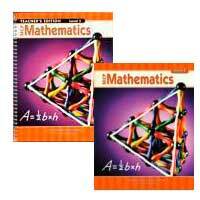 The student workbook for MCP Mathematics Level E is a consumable paperback. MCP Math Level E (5th Grade) Teacher’s Guide, 2005C Ed.